Hangover, the consequence for overindulging in too many booze can come with many severe symptoms. One of the symptoms is unusual severe torso ache. Chest pain day after drinking alcohol is not uncommon for dedicated drinkers with a long history of binge drinking. Chest pain after heavy drinking may occur several hours after the last sip depending on individual body functions. A hangover chest pain should not be ignored as it could be fatal. What is hangover chest pain? Why does hangover cause chest pain? How to cope with hangover chest pain? What are the signs that one needs to see a doctor? Severe chest pain after drinking alcohol can be attributed to numerous causes. Many might consider chest pains after drinking alcohol as a complication of booze intake. The fact is that the alcohol might just be a trigger for a predominant disease in hiding. Hangover upper body ache can generally be defined as any form of ache experienced in the chest after rounds of alcoholic beverages. Whether the pain is experienced a few hours after drinking or after a 2-day hangover, it is still a health threat. Let’s take a look at probable causes. Many people who experience chest pain while drinking alcohol usually have impending medical conditions that have been aggravated by the consequent hangover. When one consumes alcohol to excess there are after effects which occur alongside morning after such as a spike in blood pressure, chronic or acute pancreatitis, medications become ineffective, hormonal conditions, heart syndrome, and others. Torso pains after a night out may be closely linked to what causes a hangover headache, simple muscular aches caused by fatigue from a night out activities or by spiking blood pressures. Bad hangover effects and muscular aches can be due to cramps caused by loss of electrolytes from urinating. These electrolytes include calcium, sodium, and potassium, which are the chief elements of muscular health. Other combined issues, such as an increase in the levels of acetaldehyde, a toxic compound formed from the breakdown of alcohol and the presence of congeners may also contribute to this negative effect. It may also be spurred by heavy dehydration due to the diuretic effect of alcohol, metabolic acidosis (excess acid in the bloodstream), hormonal spikes due to the exhaustion of glucose in the body, as well as the pressure on one’s cardiovascular system. This may result in hangover joint pain and other complications. Anxiety is a mental health issue which presents with panic attacks, palpitations, muscular tension, insomnia, and others. Anxiety can be triggered by excess alcohol leading to a sickly morning after. The effects of alcohol can be neurological leading to certain levels of hypersensitivity to light, sound, and other elements accompanied by panic disorders which in turn puts pressure on the heart muscles. This contributes to chest pain after binge drinking. The disease is characterized by distortions in the heartbeat of drinkers, usually after a night out or a whole weekend of partying and binge drinking. Chest pains from drinking alcohol can be attributed to one of the most popular of the holiday heart syndrome; Atrial Fibrillation. Habitual, moderate, and even first-time drinkers can experience chest pain from drinking alcohol due to atrial fibrillation. This condition can begin 12 hours after the last shot to 36 hours after overindulgence. Upper body aches after alcohol may continue for as long as 24 hours. Many people who have experienced chest pain after drinking alcohol the next day have found themselves in the ER. Atrial Fibrillation (A-fib) is characterized by rapid heart rates and palpitations, weakness, breathing difficulty, chest aches, the risk of stroke, and other heart complications. Atrial-fibrillation episodes start with irregular beats with lack of coordination between the upper chamber of the heart and the lower chamber. The abnormal rhythm can be very persistent and even affect other organs in the body by causing blood clots circulating to other parts of the body and organs. It can also cause poor oxygen circulation in the blood affecting vital organs and leading to a possible stroke. People who experience chest pain after a night of drinking are usually advised to go for medications such as blood thinners to avoid clumps in the blood circulatory system, that is after consultation and full diagnosis by a medical doctor. Upper body aches, dry heaving after drinking and uncontrollable vomiting are usually experienced by those living with this syndrome after binge drinking. People with this condition have a very long history of binge drinking. An underlying carcinoma, if not detected early, can be stimulated by a few shots of alcohol or a hangover and can lead to severe chest ache. This condition is known as Hodgkin’s lymphoma. Torso ache when drinking alcohol is experienced when ethanol in blood flows into the lymph nodes affected by the carcinoma; this causes extreme aches. In this condition chest hurting after drinking alcohol can be due to the forced expansion in the size of the heart and the thickening of muscles surrounding the heart. It makes the vessels smaller, weak and results to chest pain after alcohol. This condition is triggered by hangovers due to heavy drinking and can lead to sudden heart failure. 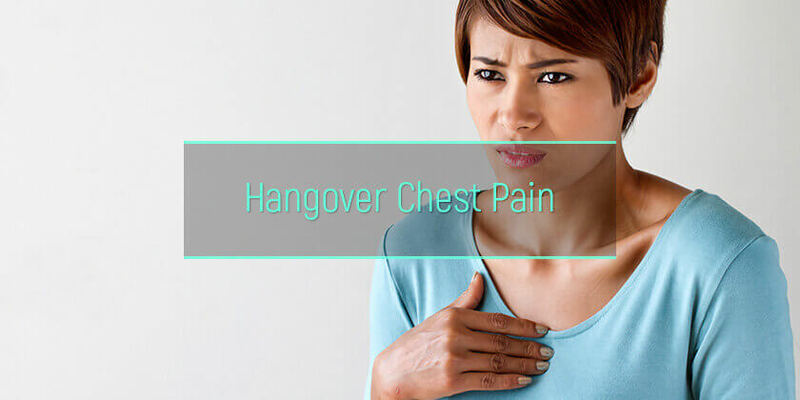 Many people who have complained about the hangover chest pain have been observed to either have high blood pressure, combine different alcoholic beverages with antidepressants that inhibit MAO, or with low blood pressure due to blood-alcohol toxicity or gene-based ALDH2 deficiency. Stomach and chest pain after drinking alcohol may be pancreatitis. It is characterized by upper abdominal pains, throwing up black after drinking, nausea, and other pains radiating into the back, breast, and organs. Chest pain after vomiting alcohol is not uncommon due to the damaged pancreas from years of excessive drinking. These methods may vary in effectiveness from one person to another. The only way to cope with chest pain hangover is to seek professional help, or better yet one should pay attention to the amount of alcohol one consumes by keeping it moderate or at a minimal or simply abstain. 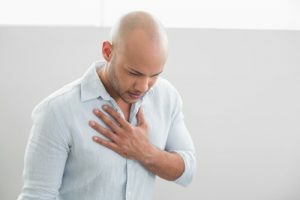 Recurring chest pain after drinking beer, wine, vodka or any other alcoholic beverage coupled with vomiting or dry heaving, palpitations, joint or muscular pain and or numbness, tremors, and stomach aches radiating to the chest or back after binge drinking can be a sign. Alcoholism often presents with chest pain day after drinking accompanied by other symptoms. People who often go through the chest pain when they drink alcohol are strongly advised to see a doctor immediately for checkups and directions for an emergency as these conditions can be critical depending on the system and the amount of alcohol taken. Another reason is to uncover underlying illnesses such as high blood pressure, atherosclerosis, pancreatitis, cardiomyopathy, cardiovascular disease, electrolyte deficiency, and other defects that may be triggered by alcohol during a hangover. Many people experience chest pains while drinking alcohol at different proportions. Some may experience this after a little alcohol while some others after a night of all-out partying and binge drinking. Alcohol simply acts as a catalyst for various systemic conditions to emerge. The best option on how to cure hangover shakes, chest aches, headaches, upper abdominal pains, and every other symptom is to drink responsibly, in moderation, or better yet abstain from alcohol. In caset abstaining from alcohol is impossible, it might be a sign of dependence on the substance. Contact the representatives of rehabs for alcohol abusers and get a consultation on the signs of addiction.